The unlikely savior of the St. Louis Blues’ season came through again in Game 1 of their first-round fight with the Winnipeg Jets. 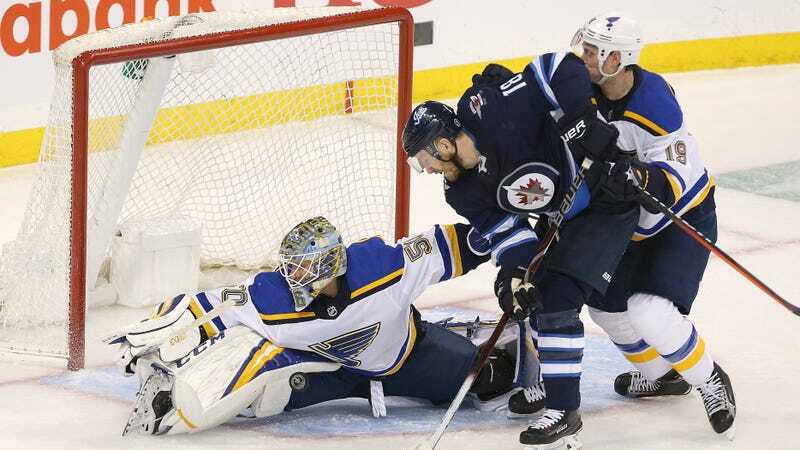 Rookie goalie Jordan Binnington, who showed up midseason to go 24-5-1 and pilot the Blues from last place to the playoffs, didn’t get overwhelmed by a sellout crowd in Manitoba and stopped 24 of 25 shots, leading St. Louis to a 2-1 road win. There are plenty of reasons why Binnington could have been understandably shaken in his playoff debut on Wednesday night, but nothing seemed to bother him. There was the revelation that he was that kind of teenaged white boy on Twitter, which he had to answer for before the game. There was the disorienting and loud whiteout of the hyped-up Winnipeg fans. There was a big hit from Mark Scheifele early on, which seemed tailor-made to psych out a green goaltender. And there was his lone imperfection of the night, which came 13 minutes into the game from a Patrik Laine bullet and gave the Jets both a 1-0 lead and the home-ice momentum. But Binnington didn’t lose himself in the moment, and he was flawless from then on out to give the Blues an opportunity to tie and then take the lead, which they eventually did late in the third on a Tyler Bozak goal. And with the final Winnipeg flurry threatening to force overtime, Binnington once again came up huge, making a stretched-out pad save on Scheifele with 15 seconds remaining to steal a series lead from the Jets. Just like everyone expected at the beginning of the year, Jordan Binnington is the hero of Day 1 in the Western Conference Playoffs.